How Unique Wall Murals Can Help Brighten Up Your Home Redecorating can be a pain. What if there was a way that you could freshen up your room and make it exactly how you want it to be? Unique wall murals are a flexible way to create your own custom designed wall decal that is both attractive and bespoke to you. Best of all, the custom wallpaper is really simple to apply. Feature walls are the perfect solution to changing the look of a room with the minimum of fuss. You simply choose a neutral tone and then designate a single wall for a bold design that becomes a focal point. Redecorating is then simply a matter of changing the look of that feature wall. Some people go for a different solid colour or use a patterned wallpaper instead of plain. If you want to do something that is truly different, then unique wall murals offer you an opportunity to come up with your own design, unique to your home, which will astonish and impress visitors in equal measure. Wall murals can be used in the living room, the bedroom and even the bathroom. Bespoke wall murals are the perfect way to create a beautiful feature wall quickly and with the minimum of fuss. Changing the look of the room is as simple – you just create your own wall decal to your specification. It is so easy to add the wow factor to your home, bar or restaurant with a stunning wall mural in the size you need to create a fabulous feature wall. You can use your own original artwork, photographs or vintage imagery. If you are stuck for ideas, a range of designs are available to choose from which can be resized to the exact measurements you need. The finished design is digitally printed onto wallpaper. There are loads of themes to choose from, so whether you want fine art, sport, music or nature there is something for you. Kids bedrooms are one of the trickiest places to decorate. Their tastes change so frequently and finding the right design can be a nightmare for parents. 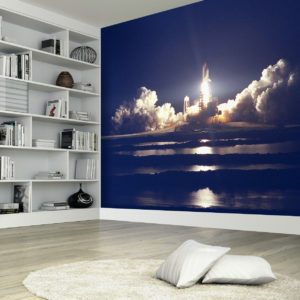 Why not create your own wall decal from one of their own pictures, or use a predesigned image from the collection of themes, such as space, aeronautical or motorsport? 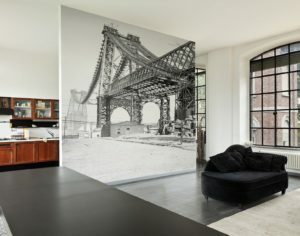 By using your an image that was created yourself, you will have a unique design that can be changed whenever you want, and when you have a feature wall you do not need to redecorate the entire room every time the children find a new fad. All of the wall mural designs available from Purlfrost can easily be resized to the exact measurements that you require. For wider walls, the designs are supplied in several wallpaper drops of equal size, each one with a maximum width of 125 centimetres. The application process is simple – the design is digitally printed onto a standard wallpaper which is applied the usual way. Because the service is bespoke, any artwork, image or photograph can be digitally printed to your exact requirements. A range of image formats can be supported, from photographs at a minimum resolution of 300dpi to vector graphics for scalable logos. So, if you would like to brighten up your home with bespoke wall murals then contact Purlfrost to find out how easy it is to create a unique and attractive custom wall decal for your home.